The UBS Global Real Estate Bubble Index 2018 report said Singapore is one of this study’s few cities whose housing affordability has improved over the past decade. The 2018 Index 2018 from UBS Global Wealth Management’s Chief Investment Office indicates bubble risk or a significant overvaluation of housing markets in most major developed market financial centers. Bubble risk appears greatest in Hong Kong, followed by Munich, Toronto, Vancouver, London and Amsterdam. Major imbalances also characterize Stockholm, Paris, San Francisco, Frankfurt and Sydney. 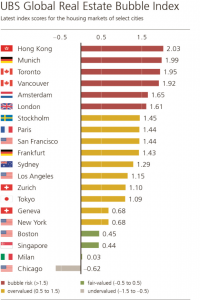 Valuations are stretched in Zurich and Geneva as well as Los Angeles, Tokyo, and New York. 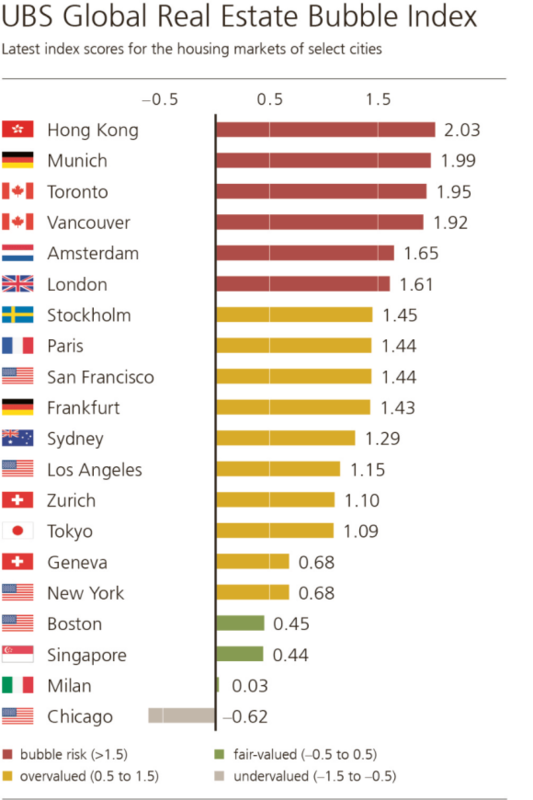 By contrast, property markets in Boston, Singapore and Milan seem fairly valued while Chicago is undervalued. The median price-to-income (PI) multiple of the cities in the study increased from 5.5 in 2008 to 7.5 today. Most households can no longer afford to buy property in the top financial centers without a substantial inheritance. As property became too pricy for citizens over the past five years in close to all cities additional regulations were introduced ranging from levying stamp duties to rent-control measures. Such regulations combined with tighter lending conditions can abruptly end a real estate boom, as the current example of Sydney shows. Overall, low housing affordability jeopardizes cities’ long-term growth potential and could cause investors to reassess their expectations about future capital gains. The report noted that in Asia, Hong Kong tops the Index in 2018, and that house prices have continues to increase by an annual rate of almost 10% since 2012. In contrast, Singapore inflation-adjusted prices staged a fulminant recovery in the last four quarters after six years of correction – rising by 9 per cent. The report said Singapore remained in fair-valued territory, and that it is one of this study’s few cities whose housing affordability has improved over the past decade. “Inflation-adjusted prices staged a fulminant recovery in the last four quarters after six years of correction, rising by 9%. Nonetheless, the market remains fairly valued. Prices are 5% below their 2011 peak and the price-income ratio is still shy of its long-term average. If you are concerned about housing affordability and ensure of funds availability for purchase, our mortgage consultants at iCompareLoan can set you up on a path that can get you a home loan in a quick and seamless manner.